Scleroderma is an autoimmune disease that can hit not only the skin, but other organs of the body. Here, we review the symptoms, causes, and management of the condition. Scleroderma is an autoimmune disorder that affects the skin along with other organs in the body. Scleroderma affects up to 100,000 people in the United States (approximately 300 cases per million), presenting most commonly in women aged 30 to 50. It is a steadily increasing diagnosis. Scleroderma is an autoimmune condition in which the immune system attacks skin and connective tissue. As a result, there is an overproduction of collagen, calcium deposits, and blood vessels narrowing. The exact cause is not fully understood, but there is certainly a genetic component, as scleroderma sometimes runs in families with autoimmune disease. Research suggests that environmental factors—such as exposure to viral infections, silica, solvents, and radiation—also may be involved. Symptoms vary greatly from very mild skin involvement through to multiorgan involvement and even death. Most people present with stiffness, tightness and puffiness in the fingers, hands and feet often triggered by cold or emotional stress. Raynaud’s disease is another common presenting symptom, one in which there is constriction of blood vessels in the extremities. This is usually triggered by cold and results in the fingers or toes becoming pale, cold, and painful. Many people also suffer from fatigue, weight loss, and loss of appetite. Other symptoms vary, depending on the type of disease and the part of the body affected. 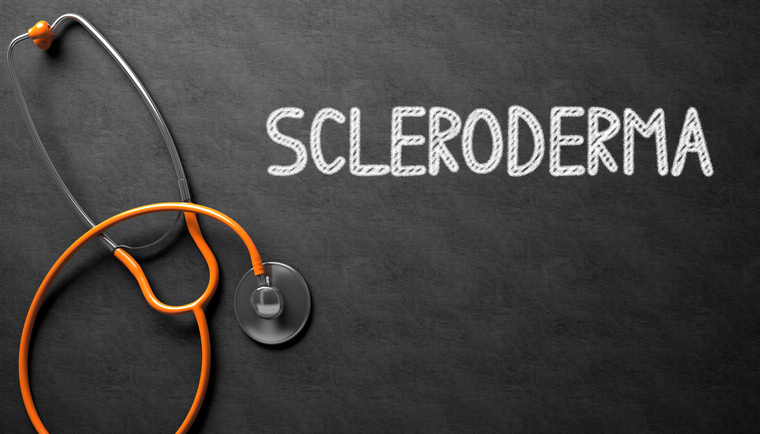 There are four main types of scleroderma: localized morphea; localized linear scleroderma; limited cutaneous systemic sclerosis syndrome; and the most severe type, diffuse systemic sclerosis. Localized morphea is characterized by oval-shaped patches of itchy, shiny hairless skin. Lesions are white in the center, with a purple border. Localized linear scleroderma is characterized by bands of affected skin on the limbs, and occasionally the head and face. Bones and muscles can also be affected. C: Calcinosis involves the formation of calcium deposits under the skin and in soft tissue. R: Raynaud’s disease (see above). E: Esophageal problems, including gastroesophageal reflux disease (GERD) and difficulty swallowing. Malabsorption of nutrients may also occur. S: Sclerodactyly involves thickening of the skin of the fingers, leading to discomfort and reduced function. T: Telangiectasias are enlarged blood vessels, which present as red spots on the hands and face. The five-year survival rate for CREST syndrome is 90 percent. Diffuse systemic sclerosis (DSS) predominantly affects the skin of the hands and also the internal organs, with fatigue, shortness of breath, difficulty swallowing, and weight loss. This can progress to fulminant systemic sclerosis—multi-organ failure and death. The five-year survival rate for DSS is 80 percent. Pain and restriction of movement, in part due to skin involvement and myositis (inflammation of muscles). Progressive Raynaud’s disease may result in ulcers and gangrene in the extremities. Wound infections may also occur. Pulmonary hypertension (high blood pressure in the arteries serving the lungs) and pulmonary fibrosis may lead to breathing difficulty and heart failure. Kidney damage and in some cases kidney failure. Heart problems, including heart arrhythmias (irregular heartbeats) and congestive cardiac failure, pericarditis (inflammation of connective tissue around the heart). Mouth problems can arise, including tightening skin around the mouth, dry mouth and acid reflux which damages tooth enamel. Teeth may fall out due to gum disease. Sexual dysfunction. Men may suffer from erectile dysfunction and women may experience vaginal constriction and reduced lubrication. Intestinal problems may include difficulty swallowing, GERD, sluggish digestion, bloating and constipation. Lung, heart and kidney complications can cause serious illness and even death. It may take some detective work to diagnose scleroderma. Your doctor will take a medical and family history and carry out a physical examination. He or she may then perform some diagnostic tests and refer you to a rheumatologist (a physician specializing in connective tissue and joint disorders). Examination of the skin using a microscope. Skin biopsy: A small sample of skin is taken and examined in the laboratory. Blood tests for complete blood cell count (CBC), muscle enzymes, inflammatory markers (ESR, CRP, CXCL4) and autoantibodies. Symptoms may warrant other tests including joint x-ray, gastroscopy, chest x-ray, and echocardiogram. There is no known cure for scleroderma or medications that halt the autoimmune process. However, treatments are available to slow progression, manage symptoms, and treat complications. Skin care. Regular skin moisturization (with perfume-free lotions, for example) may help reduce tightness and discomfort. Avoid cold weather or wear warm clothes when it is cold. Blood pressure medications can reduce vascular symptoms and limit damage to the lungs and kidneys. Immunosuppressants may suppress the immune response, but side effects are common. Physical therapy (PT) can be very useful in reducing pain, and improving function and mobility. Once your physical therapist has recommended a program, regular exercise is recommended. Ultraviolet light therapy and laser surgery may help reduce skin symptoms. Managing GERD with small frequent meals and antacid drugs (like omeprazole) may also help may reduce symptoms. Following a low-FODMAP diet may also help. Lifestyle factors. Living with scleroderma can be challenging. The Scleroderma Research Foundation recommends making lifestyle changes—avoiding tobacco, alcohol, caffeine, recreational drugs, and risk of damage to the skin (like when cooking or gardening). The SRF also recommends that you get enough sleep, manage your stress, and eat a healthy balanced diet—with plenty of vegetables and fruit and avoid processed foods, sugar, and soda. Echinacea. The Scleroderma Foundation recommends that people with scleroderma do not take echinacea, as it boosts the immune system. Emotional support from friends, family and perhaps a psychologist can be important, as living with severe scleroderma can exhausting and challenging. acid reflux, alcohol, anti inflammatory, anti inflammatory foods, appetite, balanced diet, bloating, blood pressure, blood pressure medications, caffeine, calcium, cancer, cardiac failure, collagen, constipation, cooking, diet, digestion, disease gerd, echinacea, echocardiogram, emotional stress, erectile, erectile dysfunction, exercise, exercise program, fodmap, gastroesophageal reflux, gastroesophageal reflux disease, gastroesophageal reflux disease gerd, gerd, health, health news, healthy balanced diet, heart failure, heart problems, high blood pressure, hypertension, hypertension high blood pressure, hypothyroidism, immune system, inflammation, kidney failure, light therapy, mobility, muscle, nutrients, omeprazole, pain, processed foods, pulmonary fibrosis, radiation, reflux, rheumatology, scleroderma, shortness of breath, side effects, skin, skin biopsy, skin care, sleep, stress, sugar, thyroid, tobacco, ulcers, underactive thyroid, underactive thyroid symptoms, university health news, vegetables, weather. I thought you might be interested in this article on https://universityhealthnews.com: What Is Scleroderma?